The chilly winter months mean . . . time to chow down on SL foodz. Hehe. You can grab these nom noms I'm holding here for free at Hanauta (see the Styling Credits below); the free picnic basket comes from Poche, and these naughty baby kangaroos are the current free group gift at d-lab (don't worry, yours almost certainly won't go diving willy-nilly into your pancakes like mine did). -- Plus aren't these free tights supercute? You can see another black & white design included in this gift pack on my Flickr here; plus speaking of noms, this store is giving away free frosted cinnabun earrings as well, that you can see here. The white candy sweater has been out since Halloween (NOTE: get it inworld for $5L, since it's $10L on Marketplace for some reason) but I thought these sweet candies & cupcakes print looked so cute against this free hot pink skirt. 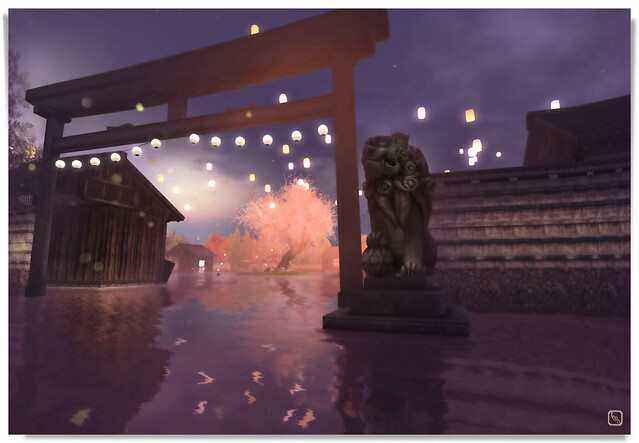 We tend to focus a lot on fashion, decor + other "gettable" items here on Free*Style, but some of the best free things that you can experience inworld are the thoughtful builds that you can encounter thruout our metaverse. The Shoe Heaven build (absolutely stunning in its architectural details) at Shoetopia 2013 is a great example of this; another is the spectacularly lovely floating "night market" at the Water Lantern Festival, which sets various stores afloat on lily-strewn waters, complete with colorful hovering lanterns glowing brightly against a smoky indigo night sky -- offering a lush backdrop for some really cute gatcha grabs, like this brown coin purse necklace I'm wearing here by C'est La Vie (unfortunately this li'l event is ending tomorrow (on 11/20), so if you want to check it, you gotta hurry ASAP). Hope everyone gets to treat themselves to something yummy today! Winter nomworthies love + fashionista kisses to all!